How Baz Luhrmann’s The Get Down butchers hip-hop history. From Grandmaster Flash’s turntable technique to Nas’ flow. 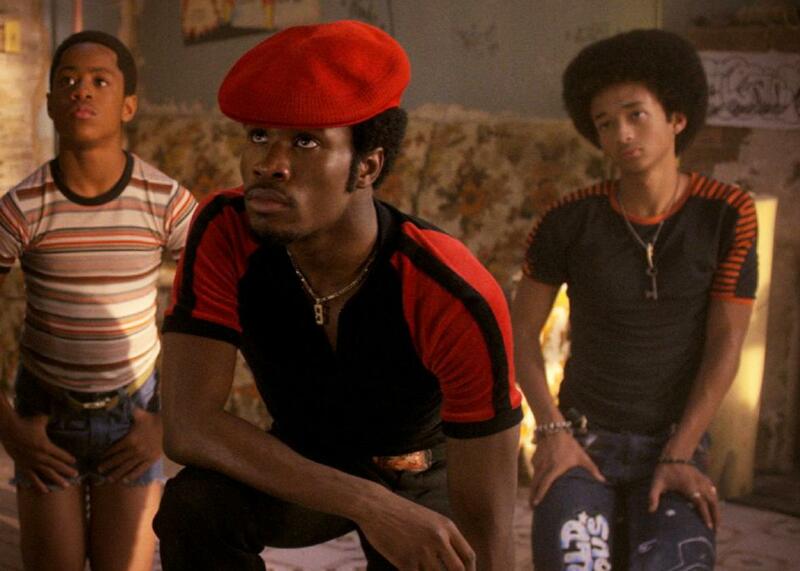 Tremaine Brown Jr., Shameik Moore, and Jaden Smith in The Get Down. Netflix’s The Get Down, which dropped Part 1 of its oddly bifurcated first season on Friday, is many things: garish, cacophonous, tonally bonkers, frequently ridiculous, and occasionally thrilling. It is, in fewer words, a Baz Luhrmann production. What it is not is “a mythic saga that chronicles the rise of hip-hop and the last days of disco,” as its press materials claim, unless mythic is meant in the way that, say, unicorns or Jedis are mythic: a cool idea uncorroborated by reality. The Get Down often succeeds as fantasy but mostly fails as history, at least the history it purports to tell. There are worse crimes than this, but the show’s slapdash flailing at authenticity might alienate what should have been its most enthusiastic audience: viewers who care about hip-hop, which in 2016 is quite a lot of people. The Get Down takes place in the Bronx in 1977, a setting it establishes in its opening montage by splashing an image of the famed “Ford to City: Drop Dead” New York Daily News headline, from 1975. (Gerald Ford was not even president in 1977.) At the center of the show’s narrative is Ezekiel (played by Justice Smith), a Bronx teenager with a gift for language who finds himself irresistibly drawn to the burgeoning subculture of hip-hop. Each episode is, effectively, a flashback, usually introduced by footage of a glitzy stadium concert in 1996, where an emcee is recounting in bizarrely literal rhymes the story of his rise from the BX to global superstardom. We are clearly supposed to infer that this is Zeke, all grown up; in these concert sequences, his character is played by Hamilton’s Daveed Diggs and voiced by Nas. This immediately raises the hackles. For starters, Daveed Diggs can rap, so why not let him? And, barring that, why overdub him with Nas, of all people? Casting one of the most famous voices ever to emerge from Queens as the sound of the Bronx is patently absurd—such distinctions have been known to be taken seriously. Granted, Nas is an executive producer on the show, but the show’s casting directors should have executive-produced a Google search of rappers from the Bronx. (The obvious choice would be KRS-One, although the thought of Kool Keith collaborating with Baz Luhrmann just nearly caused me to faint with joy.) Furthermore, as my colleague Willa Paskin noted in her review, Nas’ flow—so distinctly post-Rakim in its intricate internal rhymes and gruff, icy virtuosity—sounds distractingly removed from anything happening in 1977, when Nas was 4. Most importantly—and this is really, really important—in 1996 there wasn’t a single rapper who’d cut his teeth in the Bronx of the 1970s who was filling stadiums, or anything close. This is partly because hip-hop is a young person’s game and always has been, but it’s also because most of the music’s early pioneers never received the money and fame they deserved, certainly not in comparison to many of the music’s later stars. This is a deeply unfortunate chapter of American cultural history, and for the show’s writers to obscure it in service of up-from-the-bootstraps triumphalism feels crass and dishonest. About those pioneers: Real-life hip-hop legend Grandmaster Flash is another producer on the show, and his character’s role in its narrative (played gamely by Mamoudou Athie) is crucial—overly so. The show implies that Flash’s groundbreaking “quick mix” technique—in which Flash would cue up the same drum part on two turntables, then cycle between them using the crossfader while spinning back the record that wasn’t playing over the PA system, creating the illusion of a perpetual break—was the eureka moment for the music, which isn’t really accurate. DJ Kool Herc’s “Merry Go Round” technique, perfected at 1520 Sedgwick Avenue earlier in the decade, is generally regarded as hip-hop’s Big Bang. (Herc’s character does show up in The Get Down, eventually, although the show glosses over his innovations.) The show’s writers also opt to have its characters refer to the break itself as the get down—I kept waiting to hear breakdancing referred to as get-down dancing—a curious choice of terminology perhaps prompted by the fact that there’s currently another series in the works, at VH1, about the early days of hip-hop called The Breaks. There are a million other little inconsistencies and screw-ups to drive history obsessives crazy. The first time we encounter Flash spinning we hear him incorporate the now-iconic five-note horn line from Eastside Connection’s “Frisco Disco.” It’s a cool bit of old-school geekery (the sample appears in Slick Rick’s 1988 classic “Mona Lisa,” as well as many other places), but “Frisco Disco” came out in 1978. The soundtrack also includes multiple uses of Donna Summer’s “Bad Girls,” which came out in 1979. These are minor flubs, but in light of the other more major aspects of history that the show treats cavalierly, they add up. What’s frustrating is that there’s a great music show fighting to get out here. It’s just not about hip-hop: It’s about disco. Disco’s shimmery pleasures and profound lack of interest in gritty authenticity—the latter an aspect that made it anathema to rock and rap purists both—is the perfect object for Luhrmann’s style-over-everything aesthetic, and trappings of disco music and culture have seeped into many of his films (the “Lady Marmalade” sequence in Moulin Rouge being just one obvious example). Indeed, this show’s affections seem to lie far more in 1970s R&B than in its hacky ’90s hip-hop interludes, with soundtrack choices from the Spinners, Curtis Mayfield, Stevie Wonder, Marvin Gaye, Earth, Wind & Fire, and many others. One imagines that a pretty high percentage of the show’s already-legendary operating budget went toward licensing. In other words, it’s hard not to feel like a lot more thought went into the selection of relics like C.J. & Company’s disco scorcher “Devil’s Gun”—which features prominently in one of the show’s pivotal sequences—than into the decision to make Nasty Nas from Queensbridge into a musical avatar for the Bronx. Maybe someday Baz Luhrmann will make the disco opus that both he and we deserve. Until then, The Get Down feels a bit like a missed opportunity, in a number of senses. Too often disco, and 1970s black pop more generally, is relegated to either a postscript or a stepping stone, caught between the hagiographies of ’60s rock and soul and ’80s hip-hop. Its story should be told here, and the times when it commands the spotlight are when The Get Down really takes flight. To my eyes and ears, the show’s most stunning musical moment comes at the end of its third episode, a closing montage set to the strains of “Up the Ladder to the Roof,” the Supremes’ first post–Diana Ross hit from 1970. It’s a gorgeous song, and Luhrmann and company know it. It’s treated carefully, lovingly, fantastically and allowed to do what great music should always be out to do: create a new world, rather than recreate an old one.